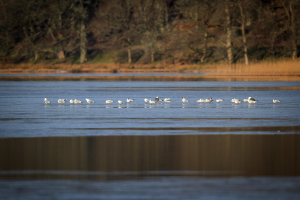 Observation - Gulls on an icy Lake of Menteith - UK and Ireland. Description: The Lake of Menteith iced over on Easter Sunday 2013! These Gulls (I count 13 black headed among them) are standing on the frozen lake. The Lake of Menteith iced over on Easter Sunday 2013! These Gulls (I count 13 black headed among them) are standing on the frozen lake.